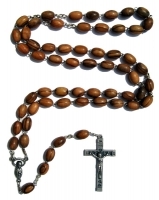 Are you looking for an accurate and refined answer to your usual question ‘where to find rosary beads?’ If ‘yes’, you have reached the right destination. We at HolyLand-Gifts.com deal in the selling and supplying of selective and elegantly crafted rosary beads that are perfect and exquisite. Elegantly crafted and designed by skilled and professional Bethlehem Christian artists and diligent craftsmen, our religious gifts and rosary beads overcome all expectations as they are made from fine quality materials such as olivewood and mother of pearl. The Holy Land artisans make these beads enticing with their hands and use very simple tools and ancient methods that have been passed from one generation to another. When you make a purchase from our user-friendly website, you not only buy a religious product of your choice at an affordable price tag but also support the skilled Christian artisans who make all religious gifts with their magical hands.